© 2011 by Brian Jenkins All rights reserved; content may not be copied, rewritten, or republished without written permission. This article was last revised on 08/17/17. Interior design doesnt have to just be about good looks. It can also be about energy efficiency and functionality at the same time! And if you dont mind making some incremental capital investments in your property that will pay off big-time, read on for some tips. Energy efficient interior design reduces the energy consumption in a home by using insulation, passive solar heating, and thermostat set-back. New and older homes alike can benefit from energy efficient design measures. Use thermal wallpaper on walls for added insulation. Cork tiles, paper-backed wallpaper, and fabric provide better insulation than paint. Art textiles such as tapestries and quilts placed on interior walls will beautify and insulate. Use blinds with a white backing or other neutral backing color to reflect the sunlight back outside. 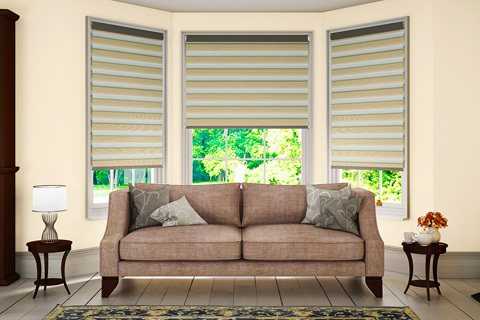 If you prefer dark colors for blinds, you can still select a product that is backed with light colors. Attractive light blocking curtains are also available. In cool climates, honeycomb or cellular shades are a good choice. The air pockets in their layered-fabric construction trap interior air and prevent it from escaping through windows. For the best results, get them custom made rather than off the shelf. Consider using ceramic tile, quarry tile, or brick veneer to add additional mass on thermal mass walls and floors. Use large decorative area rugs to prevent heat from escaping through the floor. You can remove them in the summer. This is especially effective with older homes that have hardwood floors. Increase the amount of windows on the south side of the home in order to collect heat. This is one key consideration architects use when employing passive solar concepts. During winter, use an attractive, reversible ceiling fan to pull the air up and circulate the warm ceiling-level air. Reverse the fan during the summer to push the cool air down to allow the air to flow across the room. Install insulated, decorative ceiling tiles. If you have sufficient room height clearance you can install a suspended acoustical ceiling. In tighter spaces the method is to install level batten strips and staple tongue-in-groove foam tiles to them. Patterned and dyed concrete floors can be utilized as thermal mass and are less expensive than tile floors. Wool carpet with a thick pad is a good insulator that prevents heat loss during winter and gain during summer. Thermal mass is a solid or liquid material that absorbs and stores warmth and coolness until its needed. Floors and walls are examples of thermal mass. Brick, concrete, and tile floors absorb the heat of the sun during the day and release it in the evening. During winter, thermal mass absorbs heat from direct sunlight. These dense materials absorb heat during the daytime. They then warm up the interior of a house by releasing the heat when a rooms air temperature decreases after the sun does down. During the summer, shade thermal mass so it gathers the warmth from the surrounding air and cools the room. Also, light colored paint on the walls and ceiling reflect light down to the thermal mass. Light colors, such as beige, reflect heat from a lightweight thermal mass, such as a couch, to an efficient heat storing mass, such as a brick wall. Use dark colors on efficient heat storing masses. Those living in hot climates should consider pale colored interior walls to reflect the light and reduce the need for air conditioning. These folks should avoid dark blue, gray, and brown colors since they absorb heat from the sun. Otherwise, they will likely be running their air conditioners around the clock. Speaking of air conditioning, many larger and multi-floor homes benefit greatly from setting up a heater and air conditioner zone control system. Only run the HVAC in areas that benefit the homes occupants. To further reduce energy consumption, place some lamps in corners to reflect light off of two walls. Light colored shades are the best choice, as dark ones will hold the light in. Be sure to use energy efficient light bulbs all around the house. Linear florescent bulbs are a good choice for a kitchen since one fixture will light a large area. Also, attractive LED chandeliers are available. Shiny, polished colors and surfaces reflect heat back to walls or floors where it is stored more efficiently. Consider using light colored slipcovers for couches during the summer and dark colored slipcovers in the winter. Skirted furniture is a good choice for drafty rooms. Space furniture further apart during summer to promote ventilation. During the winter, make sure the furniture doesnt block the suns rays from reaching the thermal mass. To reduce drafts in northern rooms use high-backed, overstuffed furniture. To increase heat absorption and release, place furniture so it shades the walls and floor as little as possible. There are plenty of interior design strategies you can use to increase the energy efficiency of your home. Do you have any tips of your own? Share them with our readers in the comment section below. Brian Jenkins writes about career and education topics for BrainTrack.com. He contributes content regarding interior design careers.